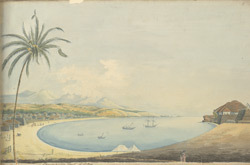 Water-colour painting of the town and harbour of Kannur (Cannanore) by John Johnson (c.1769-1846), c.1795 - 1801. This image is from a sketch-book of 36 drawings (36 folios) depicting scenes chiefly in west India and Mysore (Karnataka) between c.1795-1801. Kannur is situated on a headland overlooking a picturesque bay in Kerala, in the south of India. Vasco da Gama (1460-1524) the Portuguese explorer who discovered an ocean route from Portugal to the East came to this area in 1498 and it subsequently became an important trading station. The fort of St. Angelo was constructed in 1505 by the first Portuguese Viceroy Don Francisco De Almeda with the consent of the ruling Kolathiri Raja. In 1656 the Dutch expelled the Portuguese and subsequently sold the town to a Moplah family (a community of Arab descent) who claimed sovereignty over the Laccadive Islands, a group of coral reefs and islands off the coast of Kerala. Moplah rule was terminated by the British who attacked and captured Kannur in 1790 and it became their most important military base in the south of India. The barracks, arsenal, cannons and the ruins of a chapel still stand in the fort as a testimony to its glorious history.